I remember it so vividly. Not long ago, maybe a decade ago, video games started this thing called DLC(DownLoadable Content). It was a new idea that video game makers came up with to not only sell you the game but if you so desired you could buy extra things to either customize or lengthen the game by selling maps, new dungeons, armor, etc. As companies are doing almost anything they can to make money, it made a lot of sense to video game makers. Let’s look at some other forms of entertainment. Movies will add things to your experience for many more dollars. You can buy a Harry Potter 4K Blue Ray for $30, but for $50 you can get the Special Edition Blue Ray that includes a tiny action figure, that is one level below a toy you get at McDonald’s. In television, you can buy an entire season or series of something you can watch for free on your $200 a month cable for less than $200. In the foodservice industry, you can upgrade your medium drink to a large for only $.99, upgrade the burger from one patty to two for $3.00 and the fries from a medium to a large for only $.50. Why wouldn’t the video game industry follow suit? So back to my vivid memory. In 2002, Elder Scrolls: Oblivion offered the first recorded instance of DLC, an add-on pack that offered a player for a tiny fee, the ability to add armor to a horse you had in the game. For extra money, you got exactly nothing of real value to add to your game. It didn’t make you more powerful, faster, better at magic or even give you points. All it did was give you a customized looking horse. Behold, the majestic horse armor. At the time, people laughed. They laughed at the developers of the game for even offering such a thing for money, they laughed at the gamers who actually paid money to get it. It became like a running joke. As a long time gamer and they will know exactly what you are talking about when you say horse armor. Then, other developers started offering it on their games. A new piece of armor here, a new map there, and all of a sudden DLC just became part of a game. Nowadays, if your game doesn’t have some sort of DLC, it isn’t a complete game. In fact, if you don’t buy most or all of it, you aren’t really getting the experience that most people are getting. Imagine if you were watching a Marvel movie, say Thor Ragnorok. You buy a ticket to see the movie for $10. But when you get to the movie, you don’t get the previews, and the movie starts right away. Some scenes are glitchy, others that would help make sense of things, are cut and those two awesome scenes after the credits you can get, but only if you pay $5 extra. That is how video games are now. Now even app games are getting into the act. Don’t say you have never played Candy Crush, or Angry Birds, or Disney Tsum Tsum. All these game are “free” to play, but if you get way too much into it, there are options to pay money too. I don’t know what you pay for in Candy Crush, but in Tsum Tsum, my addiction of choice on my phone, you can pay for rubies. If you are too lazy, or busy to get coins all the time, you can buy virtual rubies to get more coins, to get more Tsum’s. Trying to explain that to your friends that don’t play a game is a little embarrassing doncha think? They say things like, “You are paying real money for virtual rubies? What does that actually get you?” You stutter, stammer, and change the subject. The other day, I think we as a country, people or world reached an absolute apex of stupidity. A person I know downloaded Animal Crossing, an app version of a Nintendo game. She was reading off the things you would get if you paid extra money for this free game. You can buy virtual fertilizer. Oh crap. 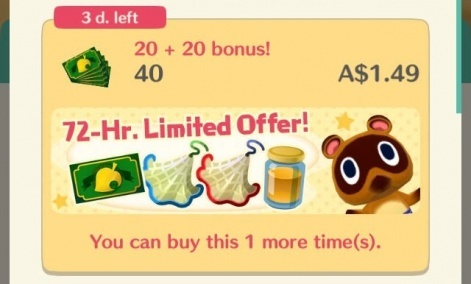 You would get Bells (their version of money), extra prizes, etc. and more fertilizer. Let me repeat. Virtual Fertilizer. Another word for fertilizer is crap. We as a society will now, without hesitation buy Virtual Crap. Amazing. We used to say it as a euphemism. And now we buy Virtual Crap with real money. We are awesome. What about you? Do you buy virtual stuff with real money? Just go ahead and admit it. It will help your bitterness grow. And if you need growing your bitterness, you can buy some Virtual Fertilizer. Omg. I’m not a gamer, never have been. Never will be. But the ability to buy virtual manure? Well that’s enough to change a girl’s mind right there!! It is pretty funny. When I told my daughter I was going to blog about this, she was like, no don’t do it dad. I couldn’t resist. Seriously, they came up with a way to make you pay for virtual manure. I almost wonder if it was some sort of dare or bet. Whoever did it had a lot of guts. Apologies to your daughter, but these things must be shared!! Absolutely it needed to be shared. The fact that someone paid for that amazes me, and yet I do the same thing on other games. You want wheels with that truck? You’re gonna want wheels, maybe even one for steering. Yep, I will need wheels for the truck, and now I know I’m going to have to pay for it. The video game people are seriously good at enticing people once they are into the game. Too bad real companies aren’t good at doing this kind of thing. Yep. I am a Simmer. So I’ve paid lots of real dollars in order to own every official Sim world, outfit, hairstyle, and piece of furniture in existence. If anyone else downloads my Sim people from the “free” gallery, but they didn’t pay for the extra virtual stuff, then their Sim will end up bald, or walking around in Sim underwear instead of a cool outfit. Who doesn’t love hearing that people will not only pay for virtual crap, but the people will pay more money to scoop it up! It nice to see that there are others that have been suckered into buying lots of virtual stuff besides me and my son. Though let’s be honest. It is really cool outfits. Darn, haven’t been a gamer since the old N64 days, so I’ve missed out on all the cutting-edge disappointment. Yes, the N64 days were a good time. I assume that I will be talking about these days in a nostalgic tone and being disappointed about it too. I have never paid for DLC. But my wife does. She buys virtual coins, with real money, in order to play virtual slot machines, where she can win virtual jackpots. When she first started doing this, I thought she was mentally ill. Frankly, I still do. But the last time I confronted her she bitterly lashed out at me, yelling at me to leave her alone. Sigh, I guess she’s a virtual gambling addict who spends real money to win virtual money, and she’s not willing to admit she has a virtual problem. Well, soon we will just all be jacked into virtual reality like in Ready Player One, so I won’t make a difference whether it is all real money or virtual. As long as it means something to the person. Nope, I’ve never bought candy hammers, gold bars, or extra lives in Candy Crush. I just keep on playing the levels until I can move on. I do like the daily wheel spin that gives me a free booster, though. Yep, most people don’t. But all it takes is a few people to be enticed and they make a mint. Yes, I wouldn’t mind the money they make, even getting 99 cents a purchase. If only I could code some virtual crap I would be making tons of money too.